One of the Zenith City’s most distinctive Romanesque Revival mansions, the Hartley’s brick-and-stone home stood poised on the banks of Chester Creek. It had arched windows trimmed in stone, four patterned brick chimneys, gables, porches, and triangular dormers bursting from its red tile roof. 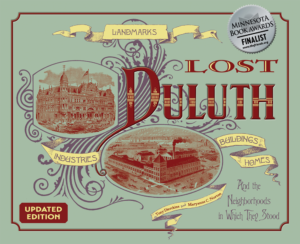 Inside, the twenty-one room house boasted ten fireplaces and was the first home in Duluth wired for electricity. It also had a primitive air conditioning system which carried fresh air to every room and a telephone-like intercom system — and a telephone as well. According to Mrs. Hartley, once during a visit by the Congdon family, Hartley “ripped the telephone off the wall” after it rang incessantly. When built in 1889, the house stood at the eastern end of the horse-drawn streetcar line; a turntable rotated the streetcar for its return trip. 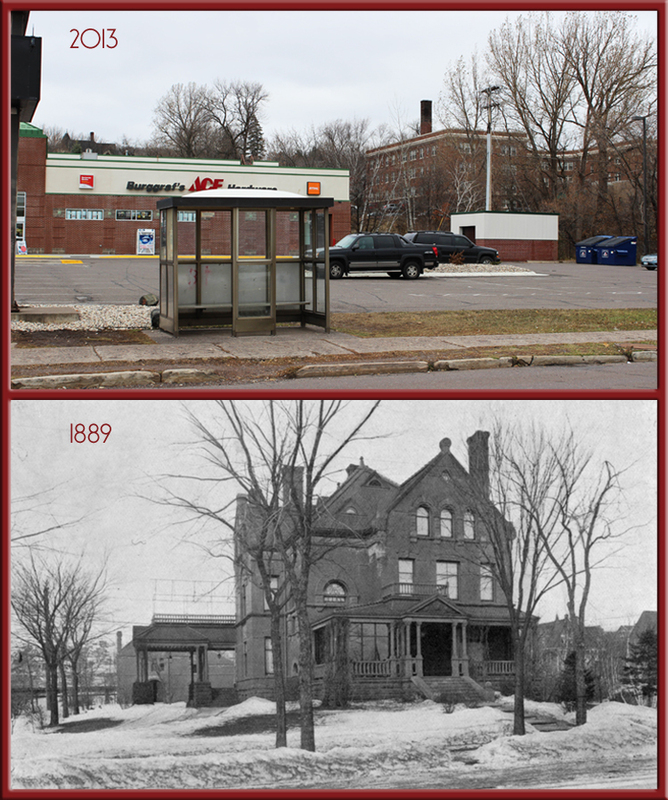 Property across Superior Street, where a bank and a shopping center parking lot now stand, was used as pasture for Hartley’s cows and horses. The estate included a stable with an elevator to reach the second floor, where John Valin, the Hartley family coachman for fifty years, kept his residence. The back of the estate (actually located on First Street), housed a small cedar cabin Hartley used as a respite from the activity of the busy Hartley household. After his death in 1922, Caroline Hartley continued to live in the house until her death in 1939. Hartley’s daughter Jessie and her husband Walter Congdon lived here until she died in 1953. The house was razed in 1954. The site eventually became a Walgreen’s pharmacy and parking lot and is now home to a hardware store.